I'm a little late showing off the "take" from this years ornament party. 24 women are involved, typically, and we all make and bring 24 ornaments to exchange. We also bring good food and eat first. After we're done eating, we do the exchange, play a couple of games and draw for a few door prizes. We always have a wonderful time at our friend Gayla's beautifully decorated, comfortable home. This year, one lady crocheted us all a potholder/hotpad that looks like a reindeer head! Incredible and so much work! 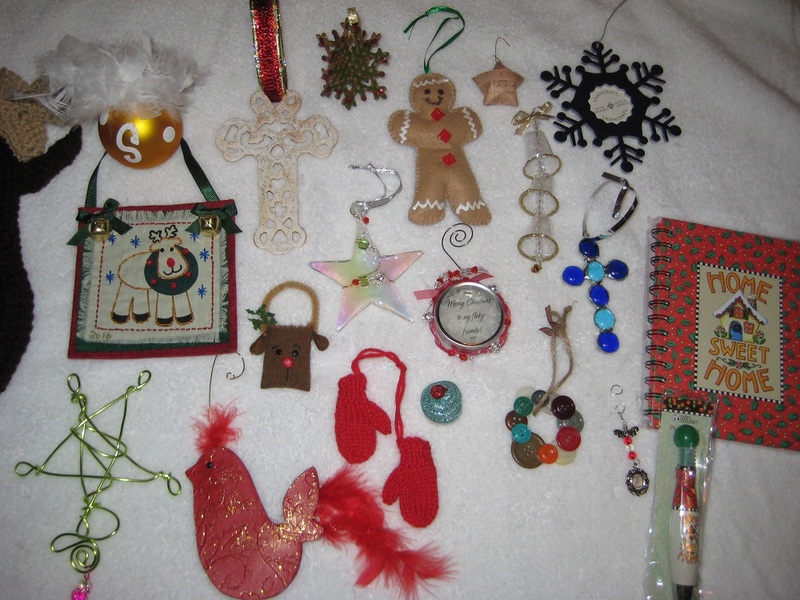 All the others were actual ornaments, made from wood, wire, paper buttons, feathers, crystals, wool, communion cups, yarn, etc. One of my favorites is from our newest member and she made these darling tiny cupcakes out of clay, they each have a tiny cherry on top that rides up and down its little stem. See how precious it is? 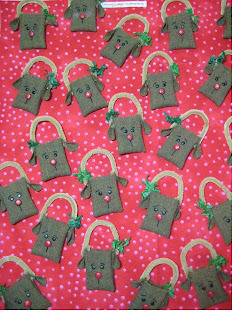 I made little reindeer bags, an original pattern but inspired by some tiny wool bags I saw on Flickr. So tiny that I was just able to slip a Dove Promise piece into each one to give it some heft. I used felted wool from a local shop, it's a pretty brown that has several other colors woven into it, like green, red, gold and blue. 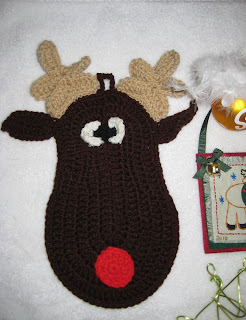 The black eyes and glittery red nose are brads from the scrapbooking dept at the store. Chenille stems for handles and the ears slide onto them. I had the tiny wired holly. The girls seemed to like them. We had a wonderful time, a few women weren't able to come so we had a smaller, more intimate crowd and that was actually nice because we were able to visit better, it was a little quieter. Lots of laughs, though! 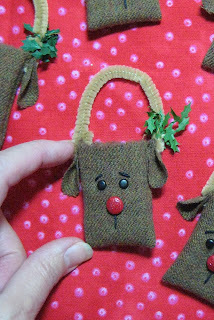 Another great party at Gayla's and I already think I know what I'm going to make for next December. :) Not telling, though! Gorgeous! 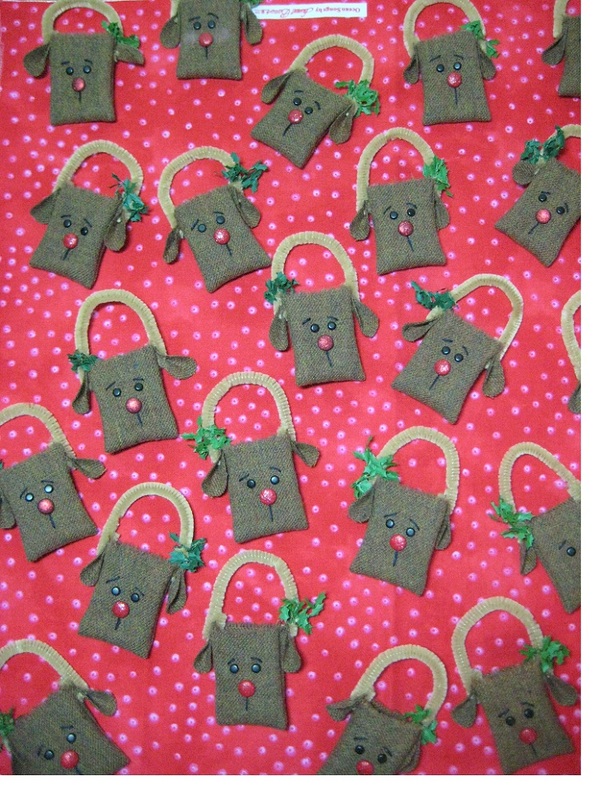 I used to collect all things Reindeer for Christmas!